So you got pests on your hops, what to do now? Before using pesticides and sprays, might I suggest on of natures predators, the Ladybug. Yes that cute little flying beetle that every kids gets excited to see. The ladybug food source is mainly aphids and mites, the most common insect enemies of the Hop plant. What better way to naturally get rid of an insect problem? I was telling some friends about ladybugs the other day and the first thing they said was where do you find ladybugs? It is actually much easier then you might think. I have several local plant nurseries that sell lady bugs in May and June. You can also order them online through Amazon and other stores. Through Amazon, I bought 2 containers of 1,500 ladybugs to release over two days. I have a major aphid problem on a bush in my front yard that I don’t want spreading to my backyard where the hops are. Like any predatory creature, the ladybug will go where the food is, so how do you keep them on your plants. You can’t train them them, putting netting over a 20′ vine is a bit impractical, but there is a handy little trick to improve your odds. First refrigerate the ladybugs for 24 hours before releasing them. This will slow them down so they are more apt to crawl then fly because it uses less energy. Secondly, release them at dusk, ladybugs don’t fly at night so they are more likely to settle down on a plant that has the food source. How does this work as preventive maintenance after the pests are eaten and the ladybugs die off? 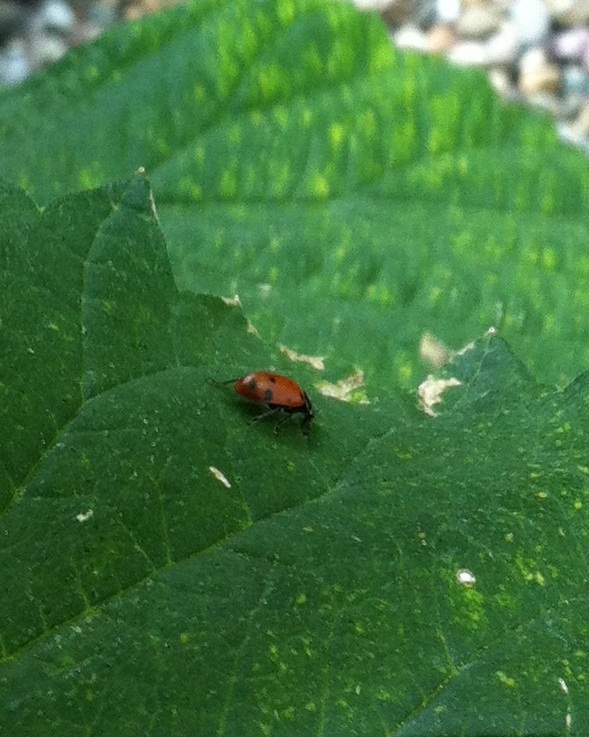 As they eat the pests the ladybugs will lay eggs on the underside of the leaves near where they are eating. This will hatch more ladybugs and take care of any pest issue you continue have. Did you know a ladybug can eat up to 50 aphids a day? Now this is not an exact science and there are some great home remedies you can use to also get rid of pests, but as a homebrewer with only 8 plants, this is more fun and my kids love seeing ladybugs everywhere! Ladybugs are great. The only problem I’ve had with them is that it’s pretty impossible to tell them to stay in your garden. They might just fly over to the neighbor. Although I suppose if you released enough that some are bound to stick around. yeah, that is a problem. But if there is food they will stick around, i also released 3k and i still see some (not all) on the plants 6 days later. as long as i don’t get pests, it will be worth it in my mind. Previous story Stand is Here, but Work is Ruining the Fun!